Stress fractures are very common in the metatarsals with the 2nd metatarsal being the most common. Stress fractures are commonly caused by overuse and are many times seen in people who have recently had an increase in activity. This can include someone who previously had a sedentary lifestyle and started a new exercise program or highly trained athletes that have drastically increased their training level. This is in contrast to a traumatic fracture in which the patient will recall a specific injury. Patients with disease weakening the bones such as osteoporosis and rheumatoid arthritis are at risk of developing stress fractures as well. 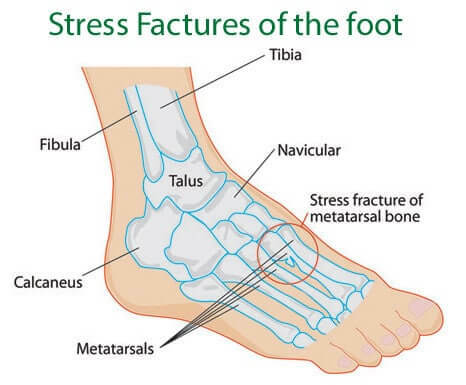 Common symptoms of stress fractures of the metatarsals include sharp or aching pain in the forefoot that is not well localized that tends to get progressively worse overtime and is worse with activity. There will also be swelling in the forefoot. Many times this can be diagnosed by history, physical exam and x-ray findings. A negative X-ray does not exclude a stress fracture as many stress fractures do not appear radiographically for two weeks after onset of symptoms. If there is high suspicion with a negative X-ray and MRI may be ordered. Treatment for metatarsal stress fractures includes ice, rest, and immobilization (usually in a removable cast boot). These injuries are very responsive to conservative treatment and very rarely need surgery. If you are experiencing forefoot pain and have recently increased your activity, it would be wise to see a Podiatrist to make sure you do not have a stress fracture. How can I prevent getting a stress fracture? The best way to prevent getting a stress fracture is to gradually ease into a new exercise program as opposed to trying to do too much all at once. For athletes and runners who want to increase their workout intensity or length, it is wise to gradually do this over a period of weeks increasing by 10% per week. For example if you are used to running 10 miles a week, increase to 11 the next week and 12 the following week and so on. Does the type of shoe affect getting a stress fracture? There are many conflicting studies on shoe wear and running injuries. Recently, there was a push towards “minimalist shoe” running as a more natural way to run that may build foot strength overtime. With the increase in minimalist shoes there was also an increase in overuse injuries such as stress fractures. Again many people were not easing into using these shoes but rather would perform their normal workout routine without giving time for their feet to adjust. Some push for pronation control and cushioning but some studies have refuted this as well saying that comfort is most important. Personally I prefer a supportive running shoe that has pronation control (since I pronate). My best advice is to have a Podiatrist that is familiar with running and running shoes check you out. Is there any way to return to sport more quickly after sustaining a stress fracture? No matter what there will be a period of time that you will need to be immobilized and not be able to partake in athletic activities. There are still many ways to stay in shape during this time such as swimming, riding a stationary bike and upper body workouts. Bone stimulators may help elite athletes return to sport more quickly by using electrical stimulation to help induce and speed up the bone healing process.